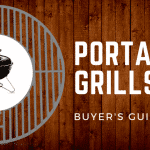 If you’re looking for something that is efficient, affordable, and still provides a great grilling experience, start your search with 3 Burner Gas Grills. They are designed to allow you to cook a lot of food at once, but many still have compact and portable designs that make them a great fit for any yard or balcony. 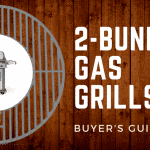 In this review, we're going to take a look at some of the best 3 burner gas grills on the market and outline why they stand out. As with any grill purchase, before you buy your own 3 Burner Grill you want to make sure you’re investing in the model that is best for you. The most important features to consider when looking through all of the different models are the heat distribution, the durability, and the usability and design. One of the most important factors to consider is the heat distribution. You want a grill with a quality heating system and durable grates that will provide even and consistent heat distribution. 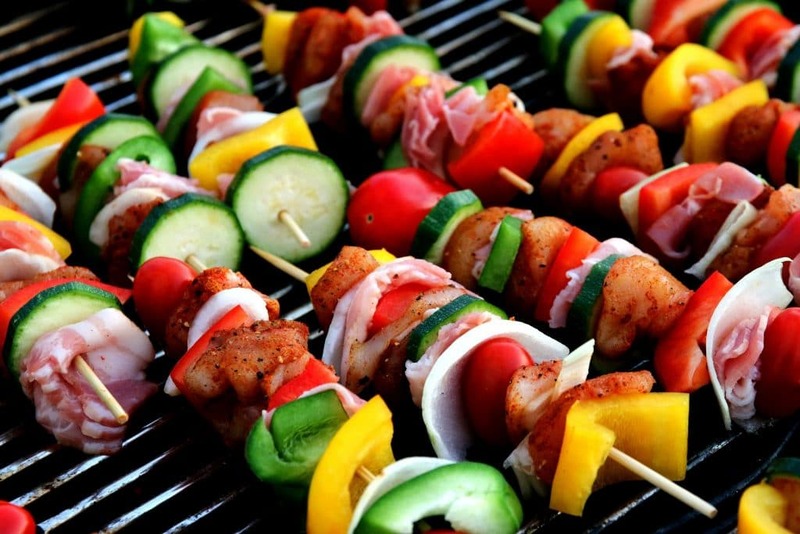 If the heat isn’t equally distributed, parts of the food will either be under-cooked or burnt, which is definitely not something you want to happen at your next family barbecue. 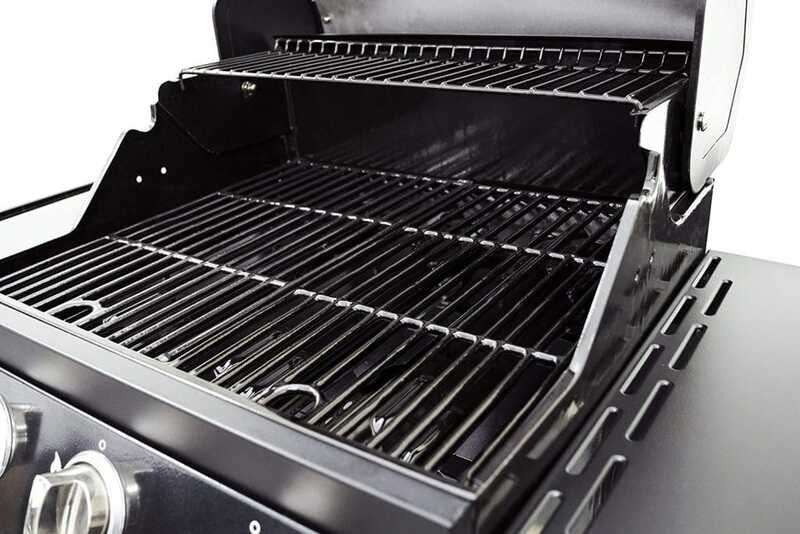 Because most grills are stored outside all year round, it is essential to get one that is made of quality materials that can endure the elements. Steer clear of models that rust or wear down easy. This is especially important in regards to the cooking grates because if they start to wear down, it will affect the heat distribution. This is where 3-Burner Grills can really begin to vary. Some have a wide array of built-in features so you can control every aspect of the cooking process, while others will have a very simple, straightforward design. Both are fine, it just depends on what you’re looking for. A 3 Burner Grill will likely be more accurate and consistent if it has more digital controls and settings, but it will also be much more expensive. One feature that is still important to check for with all models is an electric push-button because it makes start-up much faster. It’s easy to get caught up in these extra features, but a more basic model without those fancier gadgets will still get the job done. So if you know you won’t need all the extra features, opt for one with a simpler and more affordable design. 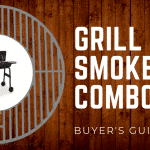 So why should you choose a 3 Burner Gas Grill over other versions? There are many advantages to having a 3 Burner Gas Grill, which are great options for their efficiency, long-lasting designs, and cost-effectiveness. You can save a lot of time by investing in a 3 burner gas grill. Opting for three burners is a good middle-of-the-road choice because it allows you to multitask and cook for many people at once while not taking up a significant amount of space. Grills that have 4-Burners can be pretty bulky and often just aren’t necessary. There’s a lot you can do with three burners, saving time and space. 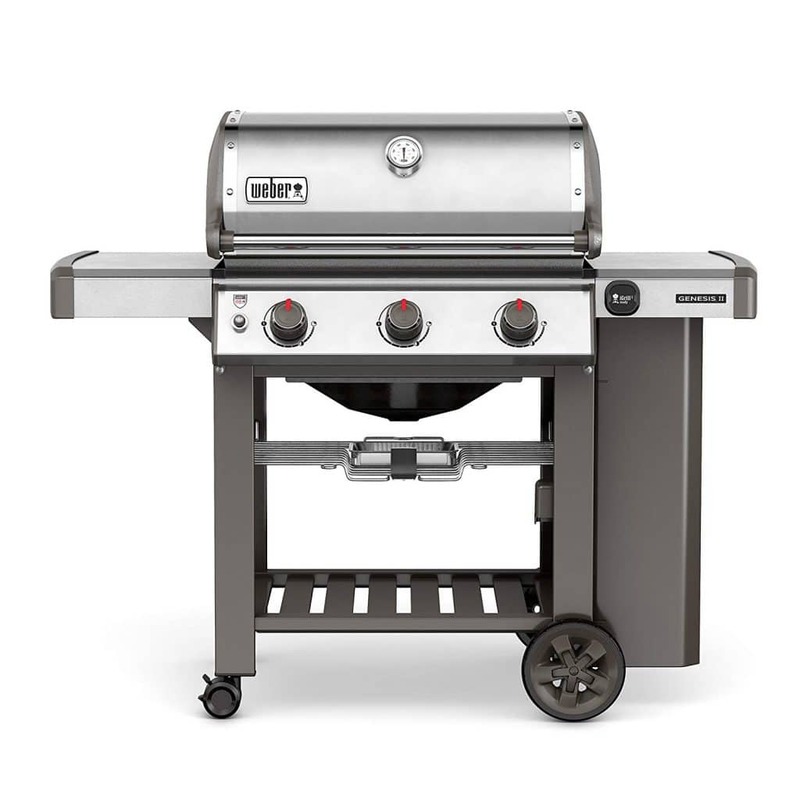 Built for the outdoors, 3-Burner Gas Grills are made to last a long time. Most have burners made from stainless steel, which is a quality and durable material. Their simple design makes them easy to use and maintain, so after you invest in the model you want, you can use it for years to come. One of the other main advantages of the 3 Burner Gas Grills is their use of gas instead of charcoal. It is much cheaper to purchase gas than charcoal, so you’ll save a lot of money when it comes time to refuel. It also makes it easier to clean the burners and provides a greater flexibility with the temperature controls. With these different advantages in mind, let’s continue on to the product review section. 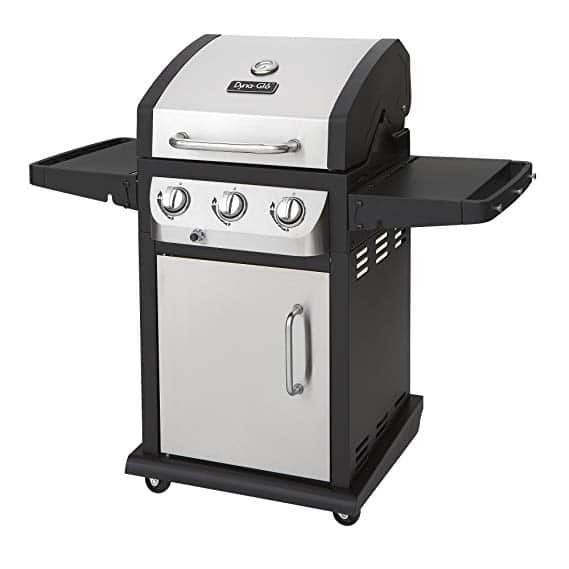 First up is the Char-Griller 3001 Pro, which is a 40,800 BTU grill with an excellent, sleek design. It’s extremely sturdy and durable. The body is made from steel and the grilling grates from porcelain-coated cast iron. 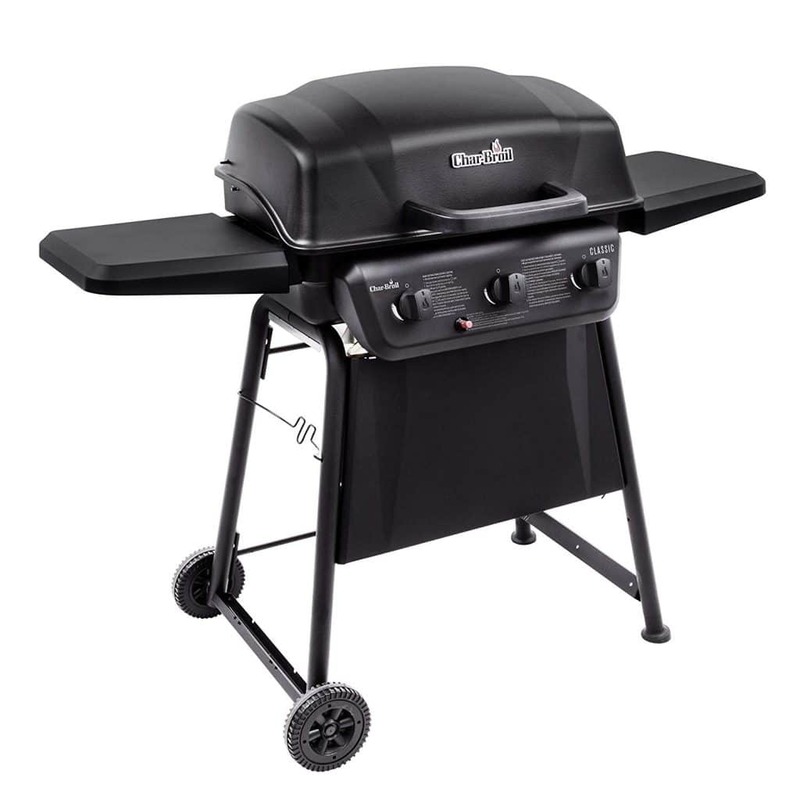 It is a powerful grill that will last a long time but isn’t bulky. It still weighs less than 100 pounds and is only about 50 inches tall. It has an electric starter, so all you need to do is push a button to start it and you’re ready to go. It has plenty of space, including 438 square inches on the main grill and 192 square inches for the warming rack. It even includes a 12,000 BTU side burner. The grill also has a side shelf and utensil hooks for extra storage and convenience. This grill is an excellent choice that you don’t have to break the bank for. It’s much more affordable than many 3 Burner Gas Grills, but you still get a product that is good quality and easy to use. The Dyna-Glo is top-notch and easy to use grill with lots of space to cook a wide variety of food. Its porcelain enameled steel firebox and stainless steel burners provide high, consistent heat up to 36,000 BTUs that holds in the flavor of the food as it cooks. It has a compact design, making it a great option for balconies or yards with limited space. Start-up is easy with the Electro-Pulse Ignition push button. There is also a lot of storage and space, with collapsible side tables that can support up to 25 pounds. It is a little pricier than the Char-Griller 3001 Pro, but is still more affordable than most other options of the same great quality. The Dyna-Glo is an great option is a durable and easy-to-use model that’s perfect for all different kinds of grilling. It provides even and consistent heat at high temperatures with precise temperature control. The heat consistency may decrease over time, but replacing the grates once to twice a year should resolve this. This compact, portable grill from Char-Broil is excellent quality for a low price. It provides 360 inches of cooking space, as well as a 170 square inch swing-a-way warming rack. It is constructed from durable materials that will last a long time through all different kind of weather. The burners are stainless steel, while the firebox and lid are made from porcelain-coated steel. It also has an easy start-up with a Piezo ignition system. The grill is supported by two fixed legs and two 6-inch wheels for easy mobility. 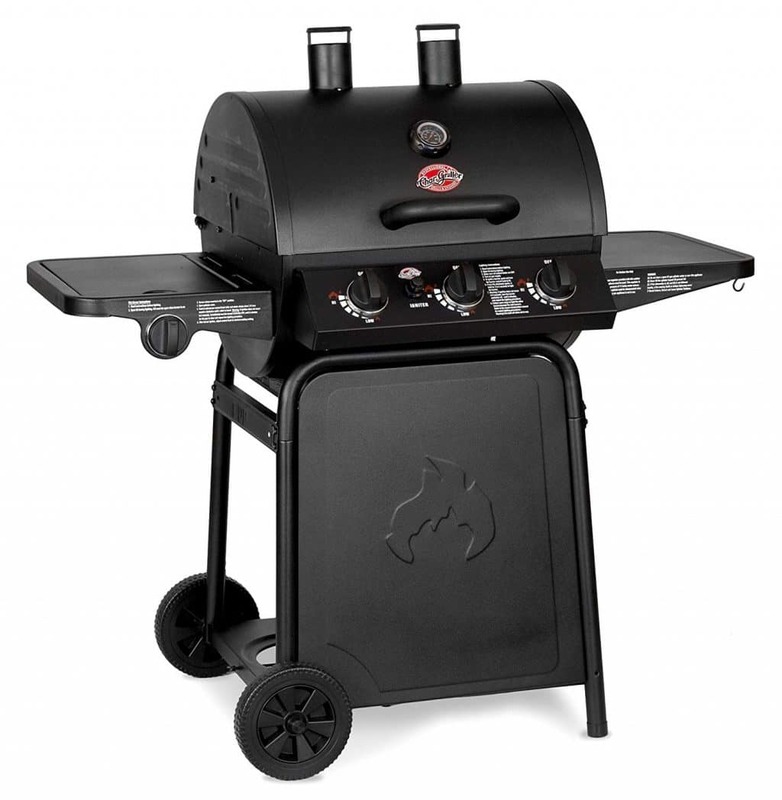 The Classic 360 is a simple, straightforward grill but still includes everything you need. Its grilling space is smaller than most, but it is an excellent option for anyone living somewhere with limited outdoor space because of its smaller size and portability. The Genesis II S-310 by Weber is grilling on another level, with many modern features to make your cooking experience as easy and simple as possible. 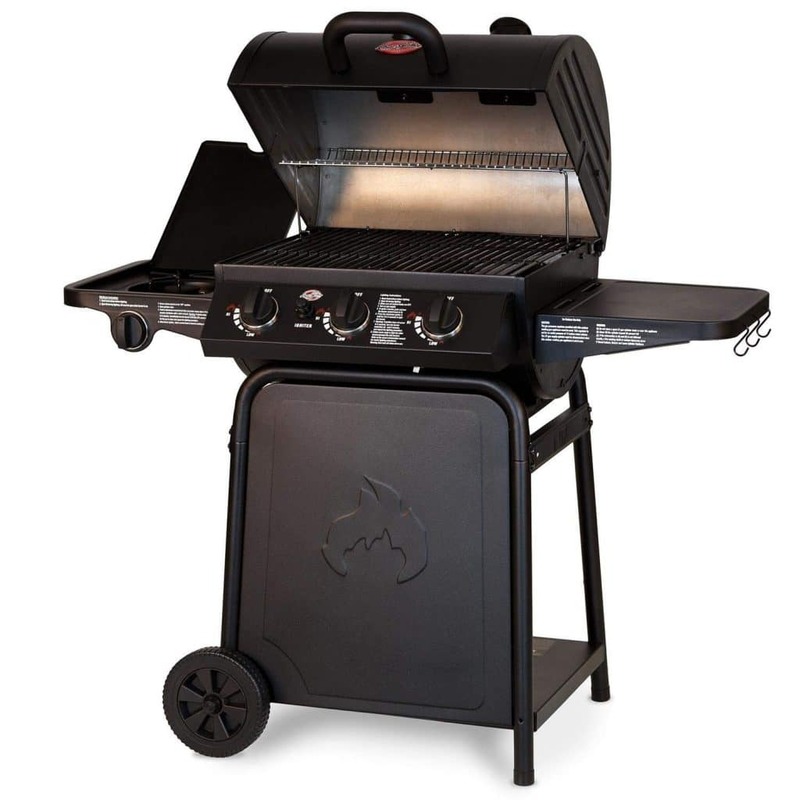 It has a GS4 high performance grilling system that includes features such as Flavorizer bars, a Grease management system, and Infinity ignition. 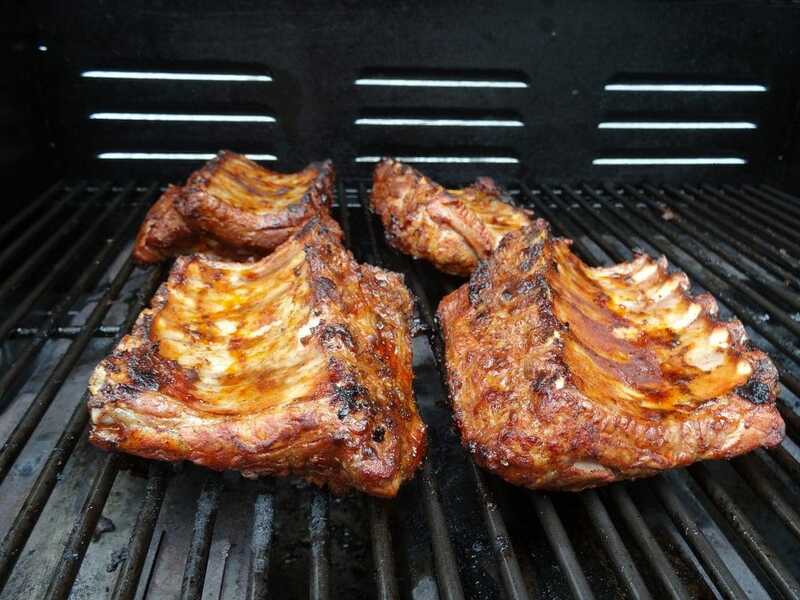 It is also iGrill 3 compatible, but the iGrill and thermometer are sold separately. It includes a total of 669 square inches of cooking space, with a primary cooking area of 513 square inches and a warming rack with 156 inches. The three burners are made from stainless steel with 37,500 BTUs and provide consistent heat distribution. This model is a great option if you’re ready to invest in an excellent quality grill that will last a long time and make it easy to cook for the entire family. It has a huge amount of cooking space and lots of modern features that make it exact and easy to use. 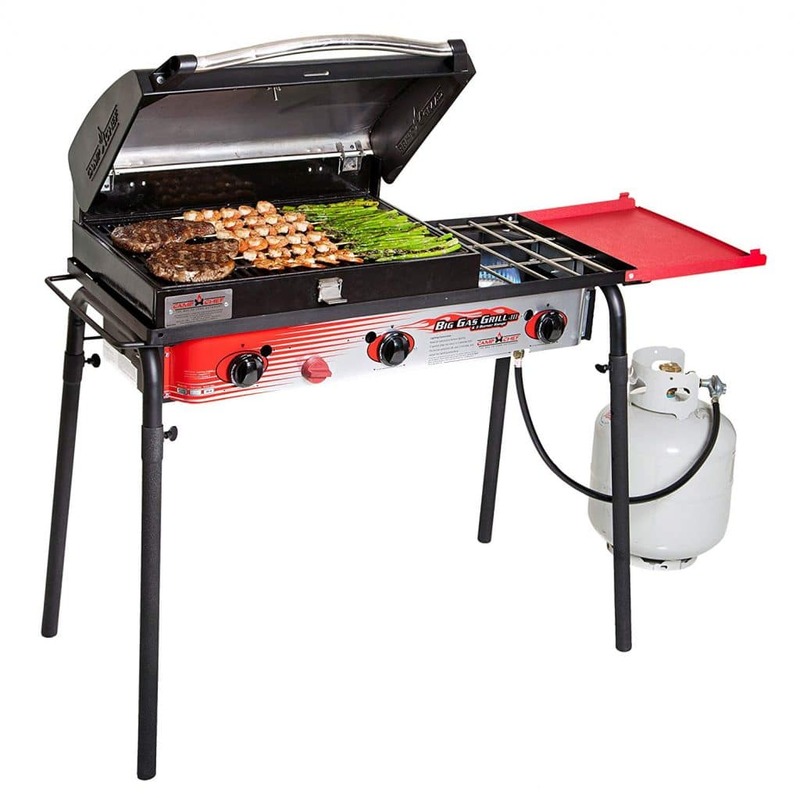 The Camp Chef is another great compact model with cast iron grill grates and three 30,000 BTU burners. Its design is a bit different from the other models, with a more rectangular body supported by 30-inch tall removable legs. It weighs about 50 lbs and has a folding shelf, making it very easy to transport. It’s portable but still provides a lot of cooking space, about 608 square inches in total. It has a matchless ignition for easy start up and adjustable heat-control knobs so you can get the precise temperature you want. 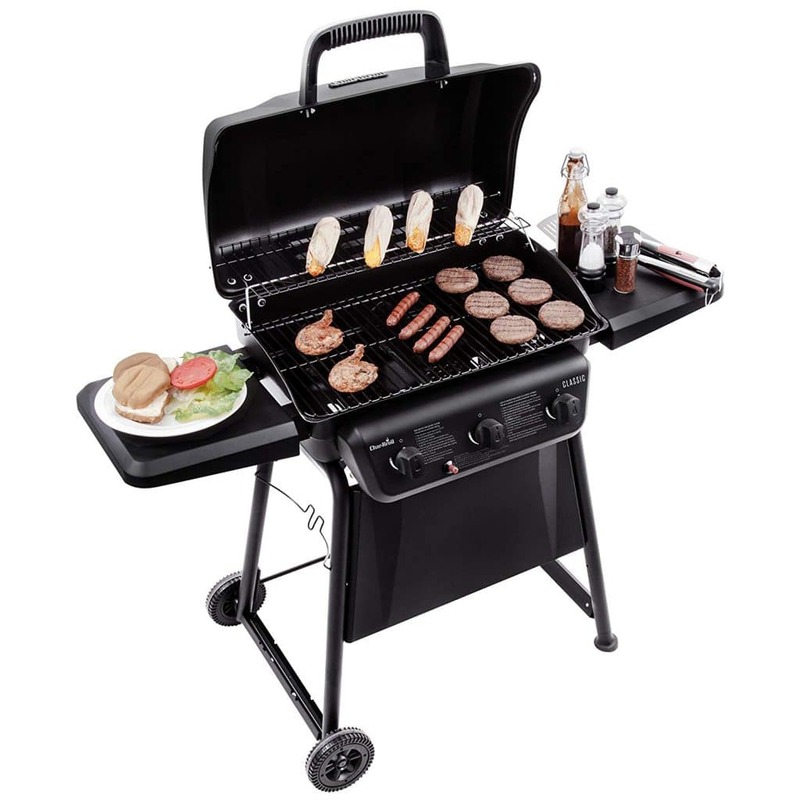 It is smaller than some of the other models, but can reach high temperatures quickly and grill a lot of food at once. The Camp Chef is a versatile and powerful grill with a lot of cooking space. With its compact, portable design it’s perfect if you’re looking for a grill with a large capacity to bring along on camping trips. 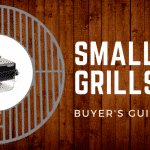 There’s a lot to consider when investing in a new grill, but we hope that this article has helped you break down the options and choose the best one for you. 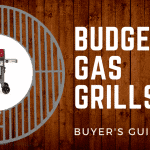 3 Burner Gas Grills are efficient, cost effective, and durable. They’re great for any kind of grilling you want to do, allowing you to multitask and cook even more great-tasting food than before.